Regarding the quest for my signature dish: Chicken Parmesan… sort of. As I’ve stated in a previous post – I have no signature dish. There’s no, “Oh, Kylee always makes that and it’s so good!” happening in this neck of the woods. That said, I’m on search for my dish. You may need a bit more of everything if you’re using hormone-filled gigantic Dolly Parton chicken breasts or if you’re making more than 3 normal chicken breasts. Preheat oven to 350 degrees F. Lightly grease a medium baking dish. preheated oven for 20 minutes. As it turns out the original recipe called for baking the chicken in on a baking sheet, then adding it to a separate dish with spaghetti sauce in it and back for 20 minutes longer. I didn’t do that. I mean, who needs to bake the same thing in two different dishes? Dumb. It turned out just fine. « Ladies Lunes. Where’d this month go? This recipe cracks me up. "Some…" Who need amounts? Also the fact that it's "fine" totally makes me want to make it RIGHT NOW. Really, though… it does sound yummy. And beating chicken with a mallet is pretty fun. Let me know if you try it. ;)And perhaps my enthusiasm for cooking is a direct correlation to why I don't have a signature dish. 🙂 I saw your dish from the other night… cheese, sausage and what else? 🙂 Happy pregnancy, lady. IT IS an art form. 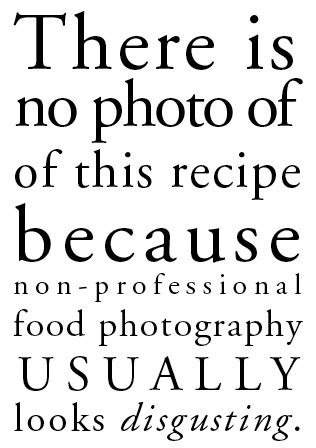 When I went to BlogHer there were classes on food photography alone. Yikes. Not for me.